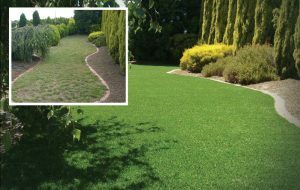 Vancouver is the perfect place for a new grass or sod installation. The best and easiest time to install a sod lawn is in the spring and the fall. Contact BUR-HAN Garden & Lawn Care today to find out details and prices for new grass at your commercial property. One of the fastest ways to turn your old or damaged lawn into something beautiful and brand new again! Our crew will come in and remove the existing lawn, clear the area where the sod needs to go, fertilize, add premium top soil, roll the lawn flat to fix any minor imperfections and lay the lawn. The finished product is nice and level and is a deep even green. There is no limit to the size or shape of yard we can do in this fashion. The grass can be walked on right away but 3 weeks are recommended (depending on the season) before heavy use takes place. Sod can be installed any time of the year in Vancouver; however, if the sod is installed after the middle of November it may not root and should not be used until spring when it will have the best possible chance at success. Though installing a lawn seems straightforward, there are number of pitfalls involved in the process which may not be obvious at first glance. Here, lawn care and landscape professionals share their tips for a frustration-free installation. Sod has instant appeal and the initial maintenance to get it established is much easier. As freshly laid sod has a tighter root system and fewer weeds will grow into it. However, sod can be more susceptible to disease than a seeded lawn, and the initial installation costs more than seeding. While a new lawn can give you instant curb appeal (and is an ideal choice when trying to sell your property) new sod does need to be maintained properly in order for it to survive and look the best so please keep this in mind when deciding on what type of lawn you are looking for. Our experts at Bur-Han are more than happy to provide you with all the best recommendations and tips we can in order to ensure your newly sodded lawn looks great and lasts a lifetime! A hand-seeded lawn is an easy option for property owners who want to do it themselves or to have help with a professional lawn company. Over-seeing an established lawn can also help thicken it up/improve the appearance of any balding spots. The disadvantage is that when you create ideal conditions for lawn seed to sprout, weed seeds will also come up and seed can take anywhere from 7 – 21 days to fully germinate. Have the crows or raccoons destroyed your lawn in Greater Vancouver? We can help you with a new lawn installation this year. With the fairly mild winters that we are experiencing, we are able to install new grass or sod at almost any time of the year (however spring or fall is most recommended). Contact BUR-HAN lawn and garden care for solutions to your lawn issues at your commercial property. We suggests adding lime depending on the base of your soil, which gives the soil the more alkaline pH it prefers. Contact the BUR-HAN team today for a free quote on our lawn installation services!